Dr B R Ambedkar’s speech in the Constituent Assembly on 25th November 1949, presenting the Indian Draft Constitution for approval. The Draft was approved by the Constituent Assembly on 26th November 1949. The Constitution came into force with effect from 26th January 1950. The Honourable Dr. B.R. 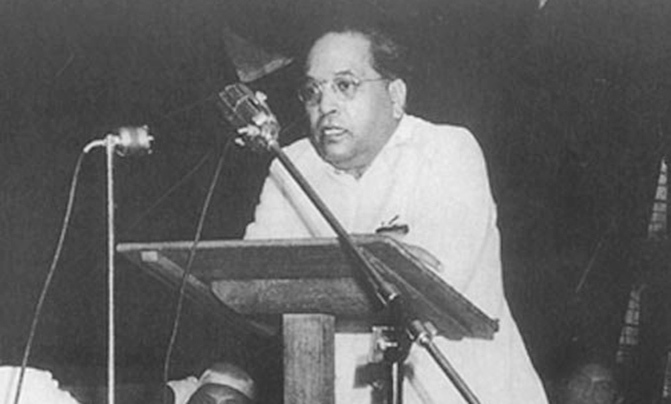 Ambedkar : Sir, looking back on the work of the Constituent Assembly it will now be two years, eleven months and seventeen days since it first met on the 9th of December 1946. During this period the Constituent Assembly has altogether held eleven sessions. Out of these eleven sessions the first six were spent in passing the Objectives Resolution and the consideration of the Reports of Committees on Fundamental Rights, on Union Constitution, on Union Powers, on Provincial Constitution, on Minorities and on the Scheduled Areas and Scheduled Tribes. The seventh, eighth, ninth, tenth and the eleventh sessions were devoted to the consideration of the Draft Constitution. These eleven sessions of the Constituent Assembly have consumed 165 days. Out of these, the Assembly spent 114 days for the consideration of the Draft Constitution. Coming to the Drafting Committee, it was elected by the Constituent Assembly on 29th August 1947. It held its first meeting on 30thAugust. Since August 30th it sat for 141 days during which it was engaged in the preparation of the Draft Constitution. The Draft Constitution as prepared by the Constitutional Adviser as a text for the Draft Committee to work upon, consisted of 243 articles and 13 Schedules. The first Draft Constitution as presented by the Drafting Committee to the Constituent Assembly contained 315 articles and 8 Schedules. At the end of the consideration stage, the number of articles in the Draft Constitution increased to 386. In its final form, the Draft Constitution contains 395 articles and 8 Schedules. The total number of amendments to the Draft Constitution tabled was approximately 7,635. Of them, the total number of amendments actually moved in the House were 2,473. I mention these facts because at one stage it was being said that the Assembly had taken too long a time to finish its work, that it was going on leisurely and wasting public money. It was said to be a case of Nero fiddling while Rome was burning. Is there any justification for this complaint? Let us note the time consumed by Constituent Assemblies in other countries appointed for framing their Constitutions. To take a few illustrations, the American Convention met on May 25th, 1787 and completed its work on September 17, 1787 i.e., within four months. The Constitutional Convention of Canada met on the 10th October 1864 and the Constitution was passed into law in March 1867 involving a period of two years and five months. The Australian Constitutional Convention assembled in March 1891 and the Constitution became law on the 9th July 1900, consuming a period of nine years. The South African Convention met in October, 1908 and the Constitution became law on the 20th September 1909 involving one year's labour. It is true that we have taken more time than what the American or South African Conventions did. But we have not taken more time than the Canadian Convention and much less than the Australian Convention. In making comparisons on the basis of time consumed, two things must be remembered. One is that the Constitutions of America, Canada, South Africa and Australia are much smaller than ours. Our Constitution as I said contains 395 articles while the American has just seven articles, the first four of which are divided into sections which total up to 21, the Canadian has 147, Australian 128 and South African 153 sections. The second thing to be remembered is that the makers of the Constitutions of America, Canada, Australia and South Africa did not have to face the problem of amendments. They were passed as moved. On the other hand, this Constituent Assembly had to deal with as many as 2,473 amendments. Having regard to these facts the charge of dilatoriness seems to me quite unfounded and this Assembly may well congratulate itself for having accomplished so formidable a task in so short a time. Turning to the quality of the work done by the Drafting Committee, Mr. Naziruddin Ahmed felt it his duty to condemn it outright. In his opinion, the work done by the Drafting Committee is not only not worthy of commendation, but is positively below par. Everybody has a right to have his opinion about the work done by the Drafting Committee and Mr. Naziruddin is welcome to have his own. Mr. Naziruddin Ahmed thinks he is a man of greater talents than any member of the Drafting Committee. The Drafting Committee would have welcomed him in their midst if the Assembly had thought him worthy of being appointed to it. If he had no place in the making of the Constitution it is certainly not the fault of the Drafting Committee. Mr. Naziruddin Ahmed has coined a new name for the Drafting Committee evidently to show his contempt for it. He calls it a Drafting committee. Mr. Naziruddin must no doubt be pleased with his hit. But he evidently does not know that there is a difference between drift without mastery and drift with mastery. If the Drafting Committee was drifting, it was never without mastery over the situation. It was not merely angling with the off chance of catching a fish. It was searching in known waters to find the fish it was after. To be in search of something better is not the same as drifting. Although Mr. Naziruddin Ahmed did not mean it as a compliment to the Drafting committee. I take it as a compliment to the Drafting Committee. The Drafting Committee would have been guilty of gross dereliction of duty and of a false sense of dignity if it had not shown the honesty and the courage to withdraw the amendments which it thought faulty and substitute what it thought was better. If it is a mistake, I am glad the Drafting Committee did not fight shy of admitting such mistakes and coming forward to correct them. The task of the Drafting Committee would have been a very difficult one if this Constituent Assembly has been merely a motley crowd, a tasseleted pavement without cement, a black stone here and a white stone there is which each member or each group was a law unto itself. There would have been nothing but chaos. This possibility of chaos was reduced to nil by the existence of the Congress Party inside the Assembly which brought into its proceedings a sense of order and discipline. It is because of the discipline of the Congress Party that the Drafting Committee was able to pilot the Constitution in the Assembly with the sure knowledge as to the fate of each article and each amendment. The Congress Party is, therefore, entitled to all the credit for the smooth sailing of the Draft Constitution in the Assembly. The proceedings of this Constituent Assembly would have been very dull if all members had yielded to the rule of party discipline. Party discipline, in all its rigidity, would have converted this Assembly into a gathering of yes' men. Fortunately, there were rebels. They were Mr. Kamath, Dr. P.S. Deshmukh, Mr. Sidhva, Prof. K.T. Shah and Pandit Hirday Nath Kunzru. The points they raised were mostly ideological. That I was not prepared to accept their suggestions, does not diminish the value of their suggestions nor lessen the service they have rendered to the Assembly in enlivening its proceedings. I am grateful to them. But for them, I would not have had the opportunity which I got for expounding the principles underlying the Constitution which was more important than the mere mechanical work of passing the Constitution. Finally, I must thank you Mr. President for the way in which you have conducted the proceedings of this Assembly. The courtesy and the consideration which you have shown to the Members of the Assembly can never be forgotten by those who have taken part in the proceedings of this Assembly. There were occasions when the amendments of the Drafting Committee were sought to be barred on grounds purely technical in their nature. Those were very anxious moments for me. I am, therefore, specially grateful to you for not permitting legalism to defeat the work of Constitution-making. As much defence as could be offered to the constitution has been offered by my friends Sir Alladi Krishnaswami Ayyar and Mr.. T.T. Krishnamachari. I shall not therefore enter into the merits of the Constitution. Because I feel, however good a Constitution may be, it is sure to turn out bad because those who are called to work it, happen to be a bad lot. However had a Constitution may be, it may turn out to be good if those who are called to work it, happen to be a good lot. The working of a Constitution does not depend wholly upon the nature of the Constitution. The Constitution can provide only the organs of State such as the Legislature, the Executive and the Judiciary. The factors on which the working of those organs of the State depend are the people and the political parties they will set up as their instruments to carry out their wishes and their politics. Who can say how the people of India and their purposes or will they prefer revolutionary methods of achieving them? If they adopt the revolutionary methods, however good the Constitution may be, it requires no prophet to say that it will fail. It is, therefore, futile to pass any judgement upon the Constitution without reference to the part which the people and their parties are likely to play. The condemnation of the Constitution largely comes from two quarters, the Communist Party and the Socialist Party. Why do they condemn the Constitution? Is it because it is really a bad Constitution? I venture to say no'. The Communist Party want a Constitution based upon the principle of the Dictatorship of the Proletariat. They condemn the Constitution because it is based upon parliamentary democracy. The Socialists want two things. The first thing they want is that if they come in power, the Constitution must give them the freedom to nationalize or socialize all private property without payment of compensation. The second thing that the Socialists want is that the Fundamental Rights mentioned in the Constitution must be absolute and without any limitations so that if their Party fails to come into power, they would have the unfettered freedom not merely to criticize, but also to overthrow the State. "We may consider each generation as a distinct nation, with a right, by the will of the majority, to bind themselves, but none to bind the succeeding generation, more than the inhabitants of another country." "The idea that institutions established for the use of the national cannot be touched or modified, even to make them answer their end, because of rights gratuitously supposed in those employed to manage them in the trust for the public, may perhaps be a salutary provision against the abuses of a monarch, but is most absurd against the nation itself. Yet our lawyers and priests generally inculcate this doctrine, and suppose that preceding generations held the earth more freely than we do; had a right to impose laws on us, unalterable by ourselves, and that we, in the like manner, can make laws and impose burdens on future generations, which they will have no right to alter; in fine, that the earth belongs to the dead and not the living;"
I admit that what Jefferson has said is not merely true, but is absolutely true. There can be no question about it. Had the Constituent Assembly departed from this principle laid down by Jefferson it would certainly be liable to blame, even to condemnation. But I ask, has it? Quite the contrary. One has only to examine the provision relating to the amendment of the Constitution. The Assembly has not only refrained from putting a seal of finality and infallibility upon this Constitution as in Canada or by making the amendment of the Constitution subject tot he fulfilment of extraordinary terms and conditions as in America or Australia, but has provided a most facile procedure for amending the Constitution. I challenge any of the critics of the Constitution to prove that any Constituent Assembly anywhere in the world has, in the circumstances in which this country finds itself, provided such a facile procedure for the amendment of the Constitution. If those who are dissatisfied with the Constitution have only to obtain a 2/3 majority and if they cannot obtain even a two-thirds majority in the parliament elected on adult franchise in their favour, their dissatisfaction with the Constitution cannot be deemed to be shared by the general public. "Courts may modify, they cannot replace. They can revise earlier interpretations as new arguments, new points of view are presented, they can shift the dividing line in marginal cases, but there are barriers they cannot pass, definite assignments of power they cannot reallocate. They can give a broadening construction of existing powers, but they cannot assign to one authority powers explicitly granted to another." The first charge of centralization defeating federalism must therefore fall. "Political systems are a complex of rights and duties resting ultimately on the question, to whom, or to what authority, does the citizen owe allegiance. In normal affairs the question is not present, for the law works smoothly, and a man, goes about his business obeying one authority in this set of matters and another authority in that. But in a moment of crisis, a conflict of claims may arise, and it is then apparent that ultimate allegiance cannot be divided. The issue of allegiance cannot be determined in the last resort by a juristic interpretation of statutes. The law must conform to the facts or so much the worse for the law. When all formalism is stripped away, the bare question is, what authority commands the residual loyalty of the citizen. Is it the Centre or the Constituent State ?" The solution of this problem depends upon one's answer to this question which is the crux of the problem. There can be no doubt that in the opinion of the vast majority of the people, the residual loyalty of the citizen in an emergency must be to the Centre and not to the Constituent States. For it is only the Centre which can work for a common end and for the general interests of the country as a whole. Herein lies the justification for giving to all Centre certain overriding powers to be used in an emergency. And after all what is the obligation imposed upon the Constituent States by these emergency powers? No more than this – that in an emergency, they should take into consideration alongside their own local interests, the opinions and interests of the nation as a whole. Only those who have not understood the problem, can complain against it. Here I could have ended. But my mind is so full of the future of our country that I feel I ought to take this occasion to give expression to some of my reflections thereon. On 26th January 1950, India will be an independent country (Cheers). What would happen to her independence? Will she maintain her independence or will she lose it again? This is the first thought that comes to my mind. It is not that India was never an independent country. The point is that she once lost the independence she had. Will she lost it a second time? It is this thought which makes me most anxious for the future. What perturbs me greatly is the fact that not only India has once before lost her independence, but she lost it by the infidelity and treachery of some of her own people. In the invasion of Sind by Mahommed-Bin-Kasim, the military commanders of King Dahar accepted bribes from the agents of Mahommed-Bin-Kasim and refused to fight on the side of their King. It was Jaichand who invited Mahommed Gohri to invade India and fight against Prithvi Raj and promised him the help of himself and the Solanki Kings. When Shivaji was fighting for the liberation of Hindus, the other Maratha noblemen and the Rajput Kings were fighting the battle on the side of Moghul Emperors. When the British were trying to destroy the Sikh Rulers, Gulab Singh, their principal commander sat silent and did not help to save the Sikh Kingdom. In 1857, when a large part of India had declared a war of independence against the British, the Sikhs stood and watched the event as silent spectators. The second thing we must do is to observe the caution which John Stuart Mill has given to all who are interested in the maintenance of democracy, namely, not "to lay their liberties at the feet of even a great man, or to trust him with power which enable him to subvert their institutions". There is nothing wrong in being grateful to great men who have rendered life-long services to the country. But there are limits to gratefulness. As has been well said by the Irish Patriot Daniel O'Connel, no man can be grateful at the cost of his honour, no woman can be grateful at the cost of her chastity and no nation can be grateful at the cost of its liberty. This caution is far more necessary in the case of India than in the case of any other country. For in India, Bhakti or what may be called the path of devotion or hero-worship, plays a part in its politics unequalled in magnitude by the part it plays in the politics of any other country in the world. Bhakti in religion may be a road to the salvation of the soul. But in politics, Bhakti or hero-worship is a sure road to degradation and to eventual dictatorship. The second thing we are wanting in is recognition of the principle of fraternity. what does fraternity mean? Fraternity means a sense of common brotherhood of all Indians-if Indians being one people. It is the principle which gives unity and solidarity to social life. It is a difficult thing to achieve. How difficult it is, can be realized from the story related by James Bryce in his volume on American Commonwealth about the United States of America. "Some years ago the American Protestant Episcopal Church was occupied at its triennial Convention in revising its liturgy. It was thought desirable to introduce among the short sentence prayers a prayer for the whole people, and an eminent New England divine proposed the words `O Lord, bless our nation'. Accepted one afternoon, on the spur of the moment, the sentence was brought up next day for reconsideration, when so many objections were raised by the laity to the word nation' as importing too definite a recognition of national unity, that it was dropped, and instead there were adopted the words `O Lord, bless these United States." There was so little solidarity in the U.S.A. at the time when this incident occurred that the people of America did not think that they were a nation. If the people of the United States could not feel that they were a nation, how difficult it is for Indians to think that they are a nation. I remember the days when politically-minded Indians, resented the expression "the people of India". They preferred the expression "the Indian nation." I am of opinion that in believing that we are a nation, we are cherishing a great delusion. How can people divided into several thousands of castes be a nation? The sooner we realize that we are not as yet a nation in the social and psychological sense of the world, the better for us. For then only we shall realize the necessity of becoming a nation and seriously think of ways and means of realizing the goal. The realization of this goal is going to be very difficult – far more difficult than it has been in the United States. The United States has no caste problem. In India there are castes. The castes are anti-national. In the first place because they bring about separation in social life. They are anti-national also because they generate jealousy and antipathy between caste and caste. But we must overcome all these difficulties if we wish to become a nation in reality. For fraternity can be a fact only when there is a nation. Without fraternity equality and liberty will be no deeper than coats of paint. These are my reflections about the tasks that lie ahead of us. They may not be very pleasant to some. But there can be no gainsaying that political power in this country has too long been the monopoly of a few and the many are only beasts of burden, but also beasts of prey. This monopoly has not merely deprived them of their chance of betterment, it has sapped them of what may be called the significance of life. These down-trodden classes are tired of being governed. They are impatient to govern themselves. This urge for self-realization in the down-trodden classes must no be allowed to devolve into a class struggle or class war. It would lead to a division of the House. That would indeed be a day of disaster. For, as has been well said by Abraham Lincoln, a House divided against itself cannot stand very long. Therefore the sooner room is made for the realization of their aspiration, the better for the few, the better for the country, the better for the maintenance for its independence and the better for the continuance of its democratic structure. This can only be done by the establishment of equality and fraternity in all spheres of life. That is why I have laid so much stresses on them. I do not wish to weary the House any further. Independence is no doubt a matter of joy. But let us not forget that this independence has thrown on us great responsibilities. By independence, we have lost the excuse of blaming the British for anything going wrong. If hereafter things go wrong, we will have nobody to blame except ourselves. There is great danger of things going wrong. Times are fast changing. People including our own are being moved by new ideologies. They are getting tired of Government by the people. They are prepared to have Governments for the people and are indifferent whether it is Government of the people and by the people. If we wish to preserve the Constitution in which we have sought to enshrine the principle of Government of the people, for the people and by the people, let us resolve not to be tardy in the recognition of the evils that lie across our path and which induce people to prefer Government for the people to Government by the people, nor to be weak in our initiative to remove them. That is the only way to serve the country. I know of no better.